Sony's new Vaio T ultrabook takes the Vaio line out of the weird limbo it had been in for the past few years, where it hadn't had a true, comprable laptop to the droves of hordes coming out. Though the Euro model of the T Series curiously came out in as Sandy Bridge, the US version will only come in i5 and i7 Ivy Bridge. That's good news, since there's zero reason you'd want a brand new laptop with last year's chipset. But sadly, using it in person, it gives the impression that it's sort of got last year's everything else. The T falls under all of Intel's new ultrabook specs, and has a brushed aluminum exterior, with some very noticeable plastic inside. It comes standard with a HDD/SSD hybrid drive—including a 32GB SATA 3 SSD for fast start and wake, but which sadly is not user-accessible, so it won't have any effect on launching apps. You can upgrade all the way up to a 256GB SSD if you like, though, as well as 8GB of RAM. (Unlike many ultraportables, the RAM isn't soldered to the motherboard, so you can do that upgrade yourself, if you're inclined.) The T also has a ton of ports, including HDMI out, ethernet, VGA, memory stick, and an SD card slot. 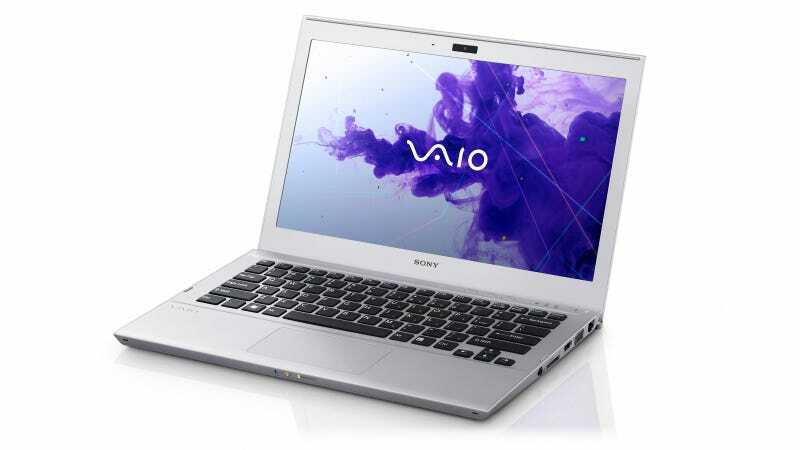 Unlike the Vaio Z, the T has a large, responsive trackpad, which should play well with Windows 8's gesture-based interface. Like the rest of the T, it's nicely made, just not as nice as the top end in ultra books. In the case, it's not in the same league as the awesome trackpads on the Lenovo U300s and the Dell XPS 13. The main negative after a few minutes with the machine is the keyboard, which has the same too-shallow throw as the Vaio Z. It's a small gripe, and one that will probably be sorted out in future models, but it's indicative of the overall feel of the T: it's a very pretty effort on a first generation ultrabook. That doesn't mean it's a waste of cash. All new Vaio computers will also come with a full suite of Sony's creative software, and PlayMemories is actually one of the more decent totally extraneous why-do-all-of-these-exist OEM cloud services. Still, it's hard to shake the feeling that you're dancing with last year's prom queen. The T Series will be available in the US this month, along with the rest of the refreshed Vaio line, starting at $800.